Why Do Insurance Rates Go Up (and Down)? You've just opened your auto insurance renewal and found the company announcement that rates are going up. Why? You didn't have a claim. You didn't have a ticket. What gives? There are hundreds of factors in the calculus that produces an insurance rate for homeowners and auto insurance. Most of these go on behind the scenes unnoticed. But there are few major factors that affect everyone across the board. Here's our top list of reasons insurance rates change just about every renewal. Claim history for the company. If a company has a bad year and pays out more money in claims than they planned on, they could raise the rates on everyone the following year to make up for the loss. Insurance companies basically have three things that make up their rates for your home or auto insurance: what they expect to pay in claims for the year, what they expect to pay in administration costs for the year, and the money on top of all that they hope to make as a profit. If they plan to pay $25M in claims and hope to make a $1M profit in 2017, but have to pay out $27M in claims for the year, they're going to have to find a way to come up with another $3M - $2M to make up for the deficit they had for claims and $1M to ensure profits for their policyholders or stockholders. If claims only cost them $23M in 2017, they'd make their profit and have a surplus, allowing them to pay dividends to stockholders and possibly give them the wiggle room to decrease rates the following year. Law and Tax Changes. Speaking of the state of Michigan, tax and law changes can affect rates. Insurance policies follow state and federal laws. When laws change, companies have to make changes to accommodate the law or make possible adjustments to their business practice - which could mean adding or subtracting coverage by law, thus affecting the pricing on a policy. Take 2016 Michigan House Bill 5457 for example. It repealed a multi-million dollar tax credit that had been given to auto insurance companies in the state of Michigan. Now that it's repealed, companies are paying higher tax amounts, and therefore have higher expenses. How do they reconcile that to avoid a year-end loss? They will probably raise rates to make up the difference, passing on the extra expenses on to the consumer. MCCA and Statutory Assessment. This is technically a subcategory of Law and Tax Changes above. If you look at the breakdown of the coverage and costs of your MI auto insurance policy, you'll see MCCA and Statutory Assessments make up about 6-15% of the total price you pay for auto insurance. That's essentially Michigan state tax. Yes, you're getting a form of tax on your auto insurance. The amount is per vehicle and regulated by the State of Michigan. It doesn't matter what company you use for your auto insurance, that amount will be the same. You cannot escape it. Michigan tends to increase the per vehicle amount each year, which mean your costs go up each year. Increases in Medical Costs. In Michigan, you have unlimited medical coverage on your auto policy in the event you are injured and incur medical bills from an automobile collision. In the past 15 years, the average cost of a medical claim from an auto accident has more than tripled. Our average costs in Michigan are 3x what a claim costs in New Jersey and 10x more what an insurance company pays for our neighbors in Pennsylvania. Healthcare costs keep rising. Average claim costs have risen sharply. 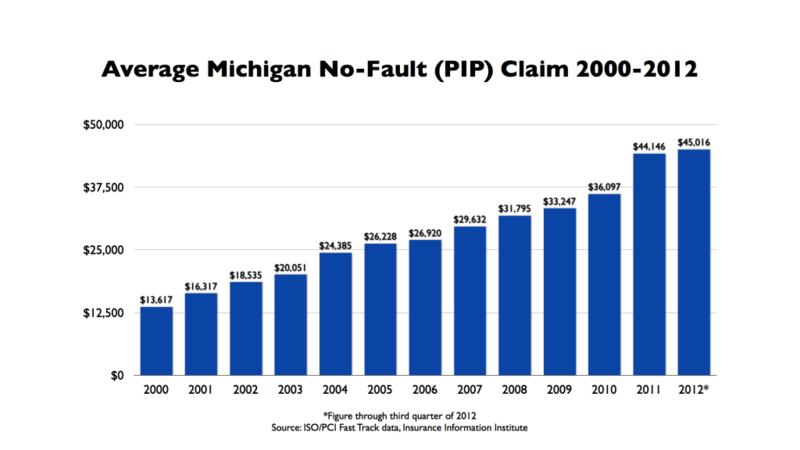 At this rate, expect your auto insurance to keep going up in price in MI. If you want more info on how to put controls on these rising costs, see the Coalition for Auto Insurance Reform. Your Credit Score. Chances are your credit score changes year to year, even if just a little bit. Consequently this may affect your insurance rates every year. Just about every company on the planet now uses your credit score as a factor in its rating of your insurance prices. This is not just at the original point of sale when you first get the policy, but also every year when your policies renew. If your credit score has worsened over the year, it could be one reason you're seeing rates go up. Conversely, if your credit score has improved, it should be one factor you may be seeing your rates go down at renewal. Global Catastrophes and Re-Insurance Companies. Did you realize insurance companies get insurance coverage also? They purchase it from reinsurers. These reinsurance providers are global in scale and insure entities worldwide. If there is a typhoon in Japan that causes a multi-billion dollar loss for the reinsurer, it may cause them to raise their insurance rates for the policies they sell to insurance companies. Again, if this happens, an insurance company's costs go up, which could result in them raising the cost of their policy to make up for the difference. Vehicle Symbol Changes. Every year the Insurance Services Office (ISO) attributes a numeric symbol to most standard automobiles. Without getting into the process behind it, the higher a symbol value on a car, the more expensive it will be to insure (all other things being equal). A 2011 Ford F150 Supercrew has an ISO collision symbol of 15. A 2013 Chevy Impala LTZ has an ISO collision symbol of 27. Between the two, ISO has evaluated that the Impala would cost more to repair in a collision and given it a higher numeric symbol. All things being equal, the Impala should cost more to insure than the F150 in this example. Here's the important part: ISO symbols change every year. Your 2011 F150 could have a symbol 15 this year, but jump up to a symbol 19 next year, thus affecting the insurance rate. Protection Class Change on a Homeowners Policy. Every homeowners policy is rated by how close the house is to the nearest responding fire department and source of water (fire hydrant). If you've lived in a more rural setting that has recently had the city or county lay water lines and hydrants, this could change the protection class on your house to an improved designation and subsequently lower your rates. The same can be said if you'd have a volunteer fire department in your city in the past, but your city is now building a new fire station with full-time responders. Inflation Guard on a Homeowners Policy. Some companies offer an automatic increase of coverage on your homeowners policy. Let's assume you're not getting that extra coverage for free. If you have this feature, every renewal your coverage will increase a bit on your homeowners insurance, which means your policy is increasing in cost proportionately as well. The factors involved in your insurance rates are extensive, and we've only named a handful. Even global events can have an indirect influence on your personal insurance premium. You have some control over these factors, like your credit score and the type of vehicle you drive. Other factors are out of your control, such as whether your company raises rates to make up for a previous year's losses. That comes down to a company's business model and operating philosophy. TFI strives to work with insurance companies that don't make risky decisions and try to keep their rates stable for their customers. If you've been experiencing volatile price swings with your insurance company, contact us to see if we can help connect you to one with a smoother client experience.